Tippy Stringer Huntley Conrad, who became a Washington personality during the 1950s as a comely weather girl issuing forecasts on the local NBC affiliate, and who left the city for New York when she married television newsman Chet Huntley, died Oct. 1 at her home in Los Angeles. She was 80 and had a brain tumor. 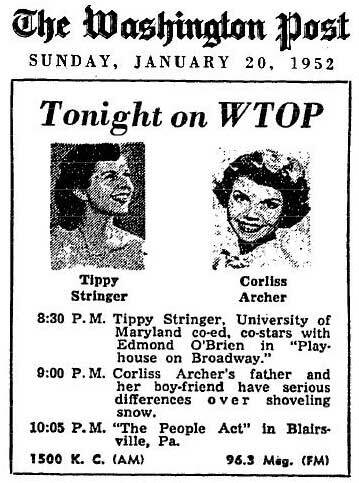 Miss Tippy Stringer, as she was known when she took to the airwaves, hosted cooking and homemaking shows on WRC-TV and radio before she landed a permanent role as the station's weather girl in 1953. She was often joined on-air by a cartoon character she created named Senator Fairweather, whose doe-eyed likeness was photographed with Tippy for Life magazine in 1955. Mrs. Conrad appeared as a weather girl twice each evening, at 6:45 and 11:10, wearing pearls and a perfect coiffure. In between, she raced to the Shoreham Hotel's swanky Blue Room nightclub, where she changed costumes to sing in two nightly floor shows. Five-foot-five, blond and slender, she was popular among television viewers and critics alike. 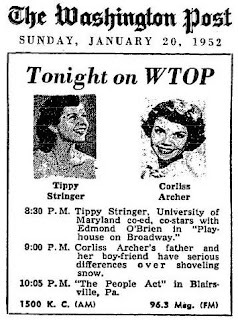 She "pitches her patter at women, but Miss Stringer herself is well-worth any male's attention," wrote Washington Post TV reviewer Lawrence Laurent in 1953. "Her long suit is fashion, beauty and the undeniable fact that she's about the cutest thing seen on TV in these parts." Washington newsman David Brinkley, whom Miss Stringer knew through her television work, introduced her to Chet Huntley, who was known nationally for broadcasting the news with Brinkley on NBC's "The Huntley-Brinkley Report." "She sat in my lap or something corny like that," Brinkley said in a 1961 interview, "and I told her who Chet was while he looked on [in] the monitor. The next thing I knew he was taking her out." The resort, which includes a golf course and a tangle of ski runs including one called "Tippy's Tumble," was sold to a Michigan company in 1976. Mrs. Conrad - then Mrs. Huntley - ran unsuccessfully for Congress in 1978 as a Republican candidate from Montana. In 1980, she met and married another nationally known figure: William Conrad, an actor who first rose to prominence as the voice of Marshal Matt Dillon on the radio program "Gunsmoke." He had been widowed in 1977, and he met Tippy during a visit to the Big Sky Resort. Mrs. Conrad moved to Los Angeles and helped manage Conrad's later career, which included a starring role in the CBS legal drama "Jake and the Fatman." William Conrad died in 1994 after 14 years of marriage. In 1995, Mrs. Conrad founded the Stringer Foundation to support causes including public broadcasting and reproductive education. Lewis Tipton Stringer was born July 15, 1930, in Evanston, Ill. Her family moved to the Washington area later that decade, and she graduated from Bethesda-Chevy Chase High School. She was admitted to the College of William & Mary in Williamsburg only to discover that the school had assumed, given her name, that she was a young man. 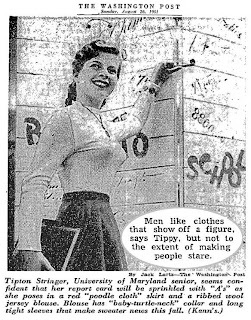 With space in women's dorms already allotted to other students, she chose instead to attend the University of Maryland - and she began calling herself Tippy. Mrs. Conrad was noticed for her looks and magnetism while performing onstage in student plays. She was crowned homecoming queen in 1951, the same year she appeared in a Washington Post article featuring local women and their fashion philosophies. "I'm very fond of crinolines because they make your waist look so small," she said. During the height of her local fame, Mrs. Conrad often appeared off-screen at local fairs and holiday celebrations. In the mid-1950s, she cut the ribbon at opening ceremonies for the Seven Corners Shopping Center and the bridge that carries East Capitol Street across the Anacostia River. An honorary member of the city's royalty, she was crowned Miss Get Out the Vote in 1956, posing at the District Building in a sash, gown and white gloves as part of a campaign to nudge reluctant voters to the polls. She also was the Washington Convention and Visitors Association's Miss Summer Jubilee; Queen of the Seabees, the Navy's civil engineering corps; and Princess of the Winchester, Va., Apple Blossom Festival.